The 50 CARDS can be used for personal reflection or in group GAMES. To start this exploration we unpacked 150 privileged behaviours we have witnessed, experienced and/or perpetrated. 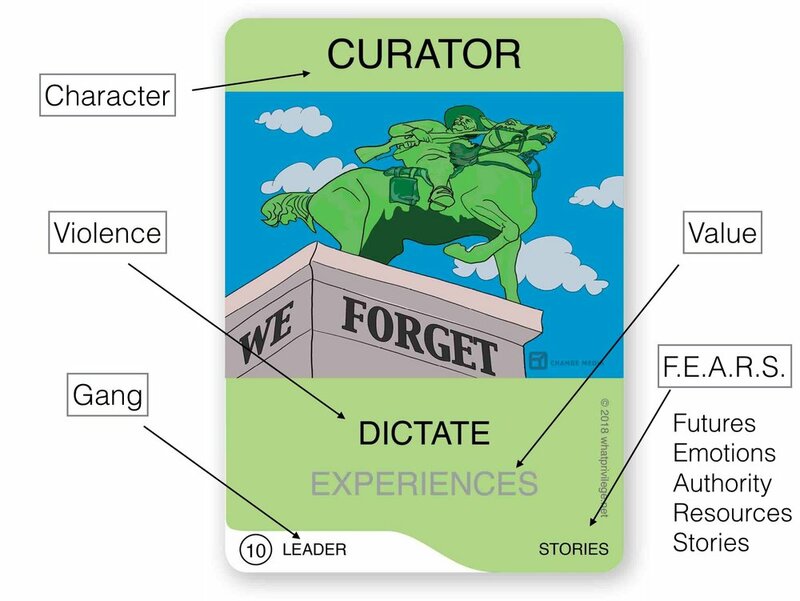 The front of the cards presents a 'character', [role/job description], and indicates what Super Power they use to control a shared human value. We have placed them in a GANG of five characters, whom exhibit a similar style of oppressive behaviour, each gang has a member who targets one of five key area we called F.E.A.R.S. On the back of the cards there are 3 values this 'character' upholds and some systematic advice how they can justify their privilege and enact their super power to 'win'. Each character hides their violence behind their ‘common sense’ values, their well-intended beliefs and pseudo-inclusivity, but don't be fooled, they are the organizing force (and pacifying and enabling power) behind the shock doctrine of intersectional violence. When you view each card online, you can find more information about their gang and the specific privileges and human exchanges they target, along with three Notice, Disrupt and Reframe questions to identify keys to solidarity that could support us to disrupt the gangs and re-organise them.